During the winter break, I decided to pay my mother a visit in the southern city of Guangzhou in China. Romanised as Canton, Guangzhou is the most populous city in the region of Guangdong and has a metropolitan population of 25 million people. What felt like the longest plane journey of all time culminated in being held up for two hours by customs controls at Guangzhou Baiyun International Airport. Fortunately, I was equipped with around seven VPNs (which I downloaded beforehand, six of which failed to work by the end of the trip) to help me gain access to the Internet. In the ﬁrst week, I struggled terribly with jet lag, but I nonetheless managed to get around to see a few places. Our first destination was Beijing Lu, the main shopping thoroughfare where one is in a constant state of defence against the insistent street sellers. In the middle of the street, there is a display depicting the original road from the Song Dynasty (960 – 1279 A.D.). At the Xinhua Bookstore, you can even ﬁnd some English books and thousands of other cheap goods you will never need, but that you’ll still love to see. As a vegetarian, I initially found it very diﬃcult to ﬁnd something to eat. What I thought was Chinese food from the takeaways I’d eaten in Europe turned out to be drastically diﬀerent in China. After a few days spent wandering about, I gave up on eating my beloved spring rolls. 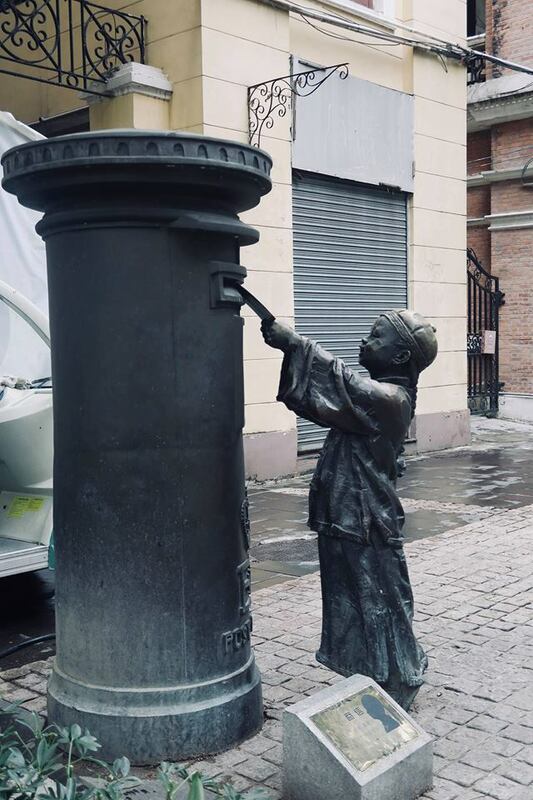 Zhujiang New Town and the Liede region (especially the Canton Place) provided access to many western restaurants, but I tried to get out of my comfort zone, eventually settling on ﬁnding Buddhist restaurants which were mainly vegetarian. However, on one particular trip to Hooley’s Irish Pub and Restaurant with a St Andrews alumnus, I was ecstatic (and ﬁlled with pride) to see Eden Mill gin (!) on the menu. A quick trip through a local supermarket revealed my ignorance regarding the wealth of fruits we have on this planet. Lo and behold, I came across the craze of our times – durian! The fruit smells like feet, and looks equally dubious. As well as a lot of pushing (and, in my case, ﬂoating into the metro by the force of people), there is also a great deal of unwanted groping. (I want to underscore that besides this, Guangzhou is very safe and ﬁlled with plenty of CCTV cameras and tough laws that discourage crime.) Your photos will be taken if you look western, and people might even dare to stroke your hair. It is a bizarre occurrence, but one that reﬂects the unfortunate reality of the marketing industry, which persistently enforces western beauty ideals. After this trip, I have doubts as to whether I will ever ask for a photo with a celebrity again. One other noteworthy point is that people on the metro seldom look up from their handheld devices. You will easily encounter a middle-aged businessman playing a racing game on his phone beside a woman in her 20s shopping on Taobao, the Chinese equivalent of eBay. You might even ﬁnd an elderly grandmother watching a soap opera. People are glued to their screens, and there is little social interaction between people. WeChat (a messaging app where you can also make transactions) dominates most communication between people. To get back to our point, the most eﬀective way to travel using the underground system would be to obtain a ticket which you can top up beforehand. Otherwise, you can download the English version of Didi, which is the equivalent of Uber. 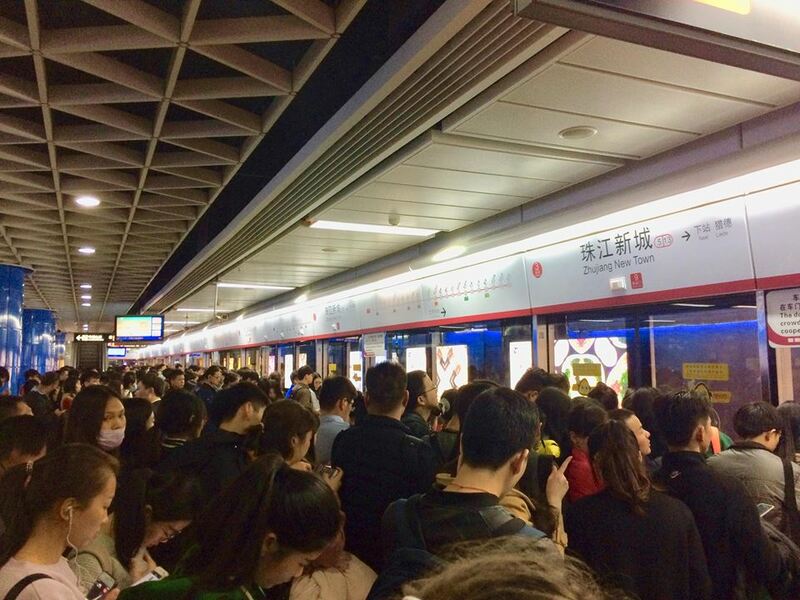 It is perhaps the easiest and safest way to travel in Guangzhou, though certainly more expensive (around £5) than the underground (which is roughly 60p per ride). For a while, I could not stop gazing up at the skyscrapers above in New Town. The most famous of these skyscrapers is Canton Tower, which lights up in rainbow colours at night. It is fairly costly to go up the tower, but it is doable if you decide to visit one of the rotating restaurants for tea. Otherwise, the hop-on, hop-oﬀ bus is also a cheap and convenient way to travel through the main historic areas of Guangzhou. 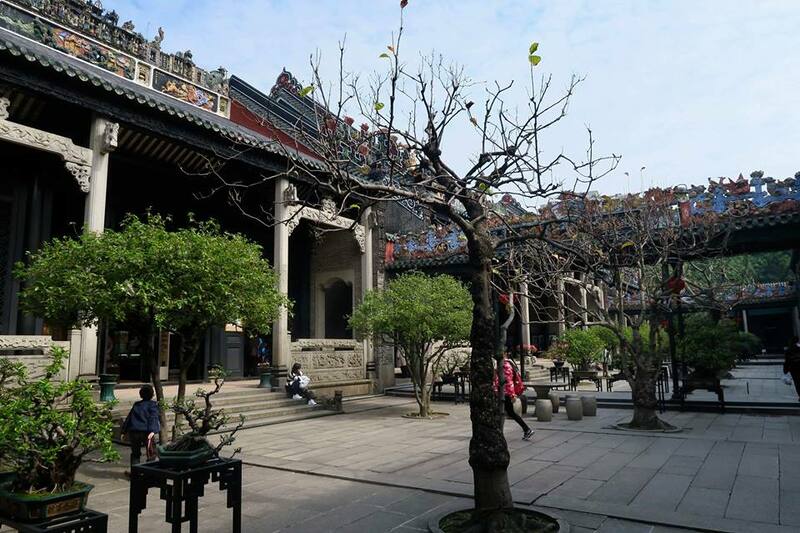 The red line takes you through the ‘The Thousand-Year-Old Ancient City’, and I recommend that you get oﬀ at the majestic Chen Clan Ancestral Hall (Zhongshan Qi Road), Guangxiao Temple (Zhongshan Liu Road) and Shamian Island (Yanjiang Road). The ﬁrst showcases traditional Chinese architecture and has wonderful stalls where you can purchase paintings done by artists on the spot. The temple is one of the oldest Buddhist temples (its history is said to date back around 1700 years) in Guangzhou. Please note, however, that when entering a temple, you must carefully step over the doorway. 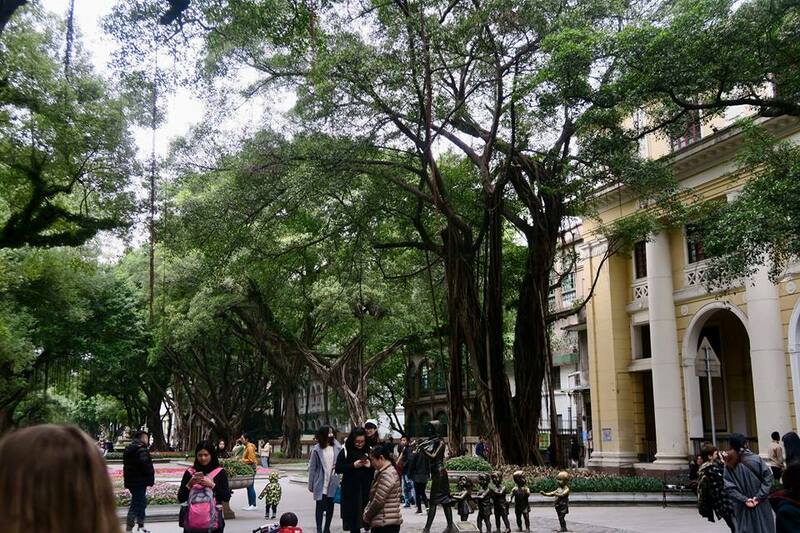 My favourite place to visit in Guangzhou was, without a doubt, Shamian Island. This sandbank island was actually divided in two by the Qing dynasty during the 19th century; one half belonged to the UK, and the other half belonged to France. Hence the colonial-style mansions and the Church of Our Lady of Lourdes on the island, which serve as reminders of a diﬃcult era involving the Opium Wars and colonial interests. The Central Avenue on the island is a paved path with beautiful, ancient trees by its side. The splendid architecture and nature of the island provide a perfect backdrop to the multitude of photoshoots which occur along here. If you desire, you can even rent a bike, but the island is small enough to get by on foot. During your walk, notice the iconic bronze statues dotted around the island. With the weather being so agreeable most of the time in Guangzhou (it is usually around 20°C, and mostly sunny with periods of rain), a drink on the terrace of a coﬀee shop provides an ideal rest. Besides the above, there is the Chimelong Paradise, the largest amusement park in China, as well as the central Teemall Department Stores and TaiKoo Hui for shopping. As well as being home with my mother, Guangzhou holds a dear place in my heart for being the first country I have visited in Asia, and I look forward to visiting again.